This perennial wildflower grows up to 0.5m in height and has a basal rosette of unlobed lanceolate leaves. The leaves are green and often carry purplish blotches. 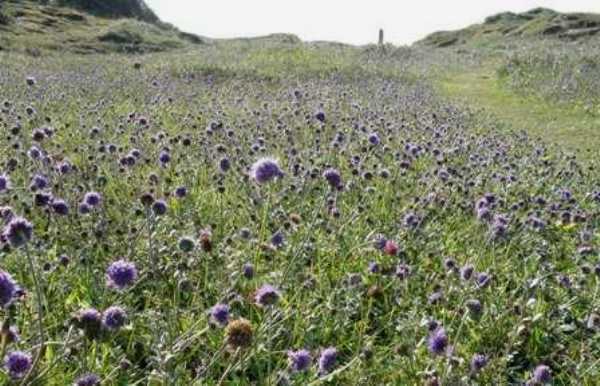 Its blue-mauve (occasionally pink) flowers grow in densely-packed compound heads 2 to 3 cm across. Individual florets are four sided and deeply funnelled. 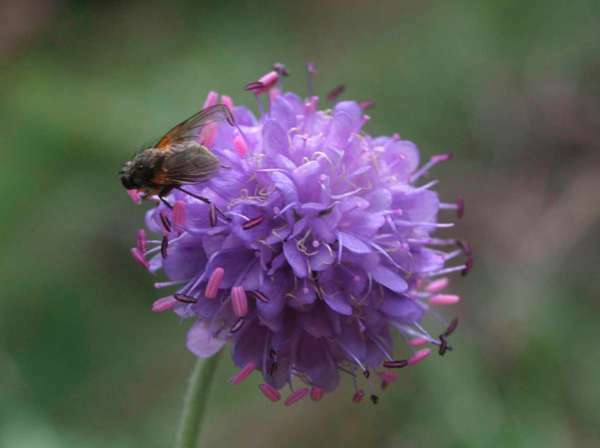 Devil's-bit Scabious is widespread and common throughout the UK and Ireland; it occurs also in western and central mainland Europe, and its range extends eastwards into parts of Asia. This member of the Honeysuckle family has a preference for damp places; it is frequently found in wet meadows and near rivers and streams. Succisa pratensis is the foodplant of caterpillars of Euphydryas aurinia, the Marsh Fritillary butterfly. Devil's-bit Scabious is usually a little taller that Sheep's-bit Jasione montana, with which it is easily confused. Sheep's-bit Scabious is a member of the family Campanulaceae. The pictures shown on this page were taken in Wales in July and August.